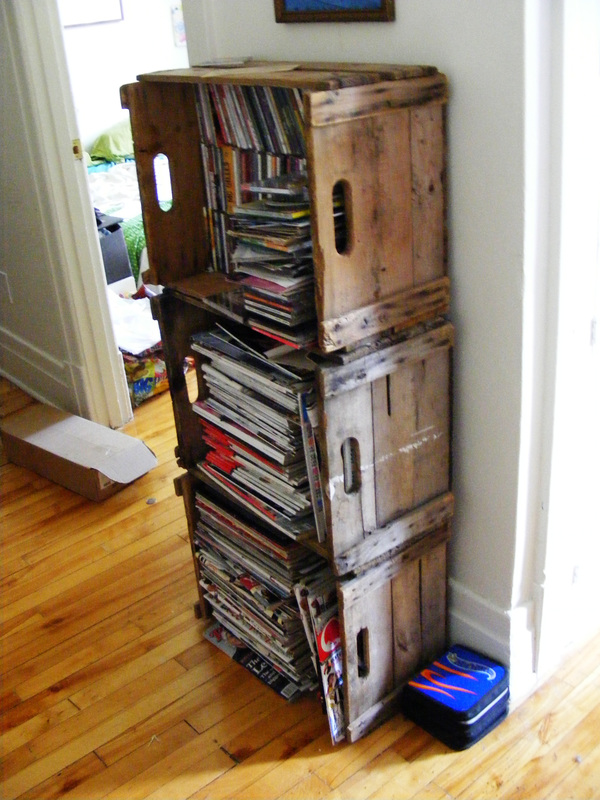 This apple crate shelf is in the hallway leading to the living room, standing just outside the door to the bedroom. It is, simply, three apple crates pilled one on top of the other. No further installation is required! The top one holds my collection of CDs that I’ve built up over the years. I love music. Most people love music. I loooooove music. Can’t live without it. One of my great shames in life is that I don’t play an instrument. I intend to fix that shortly. I haven’t bought a CD in a long time, and rarely do I pop them into my CD player now that I have speakers for my Iphone, but I wouldn’t give up my collection quite yet. Going out to buy a CD was an experience in itself. First, going to the store, finding the disc, buying it, bringing it home, then unwrapping it and placing it in the player for the first time. Buying music just isn’t as special now as it was then. Looking through this CD collection brings back memories. 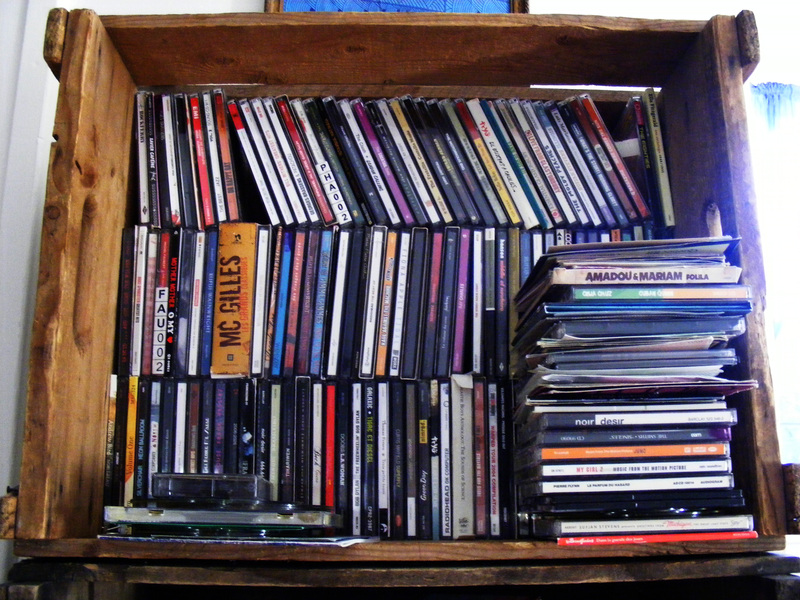 Isn’t it kind of ironic that I’m holding my old CD collection in an apple crate, while all of my music now holds in an Apple machine? Backstreet Boys- Backstreet boys (1996) They taught me about love and heartbreak. Amadou & Mariam- Folila (2012) Soulful couple that hasn’t let their handicap (both are blind) define their life. I’ve seen them twice in concert. Hanson- Middle of Nowhere A boy band that wrote their own sweet pop songs, played their own instruments and are still together 15 years later? Yes please! Luis Mariano- Les plus grandes chansons Many a dish was cleaned with this CD playing along as a soundtrack. Because of this, the dreaded nightly chore would take twice as much time to complete but turned into memorable moments for my family. All the men would stand in the staircase crooning along to Mr Mariano while waving their dishcloths in the air to emphasize their already dramatic interpretations of such old time classics. Everclear- Slow motion daydream This CD, though released in 2003, reminds me of the 90s, angsty and fun as I found them to be. Rufus Wainwright- Want two Most early Rufus fans cite Poses as being their favorite of his albums. Not me. Perhaps it is because I discovered him through this album and brought it with me when I traveled to France. I love the poppy music that plays under those beautiful but often tough lyrics. Noir Désir- Des visages, des figures Yes, Noir Désir is my favorite band. It isn’t always easy to endorse this because of what happened with the singer. However, this band had such an impact on my teenage years that I can’t let go, so I try to separate the man from his art. Neutral Milk Hotel- In the aeroplane over the sea I listen to all sorts of music (from Balkan beats to Gangster rap). I like it all from the most formatted of tunes to deconstructed psychedelic song experiments. I think that last description is close to where Neutral Milk Hotel’s music would best fit. It is epic, at times dissonant but oh so beautiful to me. Sufjan Stevens- Illinois Simply wonderful music. There are no words that I can think of right now that can do it justice. Tinariwen- Amman Iman Desert touaregs from Mali that exchanged their fighting guns for electric guitars. Listen to this loudly, with the lights out. The ambiance it creates is so incredibly powerful, it’s breathtaking. Ella Fitzgerald- Une anthologie 1948-1955 My favorite jazz singer of all time. I vividly remember when my father bought a compilation CD with her greatest hits, because she died the next day! Her warm, smooth voice has served as soundtrack to many a wonderful family dinner. Radiohead- Best of See previous article for description. Nick Drake: Way to blue- an introduction to Nick Drake This compilation of songs by troubled troubadour Nick Drake is the perfect soundtrack for calm moments: rainy days; lonely transportation rides; hours spent watching the sun rise or set…. Vulgaires Machins- Compter les corps A band that hails from my hometown. I’ve loved them for years now and never get tired of them, even listening to their earlier, more juvenile songs. They’re very politicized and I still like the punk sound they have, even though it is getting softer with every album. Karkwa- Le volume du vent See previous article for description. 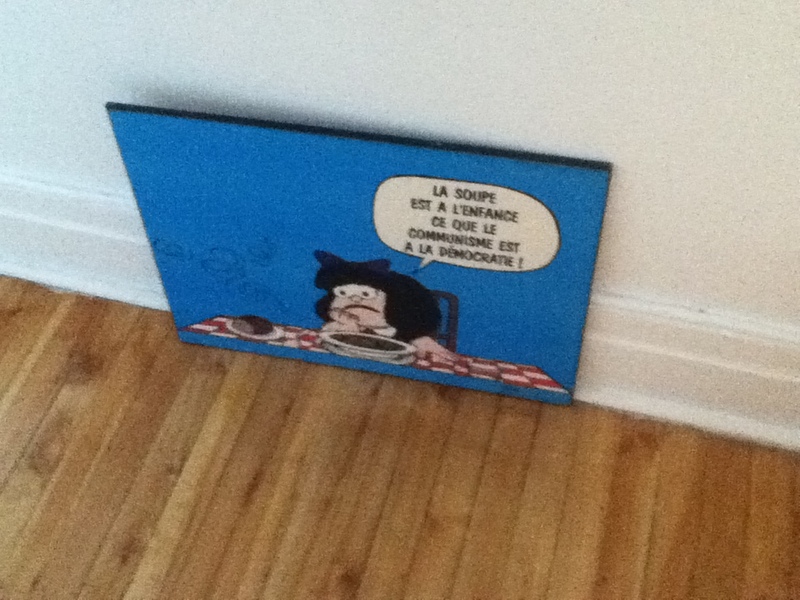 This entry was posted in Music, The living room and tagged blog, decor, decorating, home, living room, miscellaneous, montreal, music, rock, story on 28 September 2012 by lapetitelea. I wrote another article for Untapped Cities. This one is about the summer sounds of Tokyo. This entry was posted in The outdoors, Travel stories and tagged asia, japan, tokyo, travel on 24 September 2012 by lapetitelea. 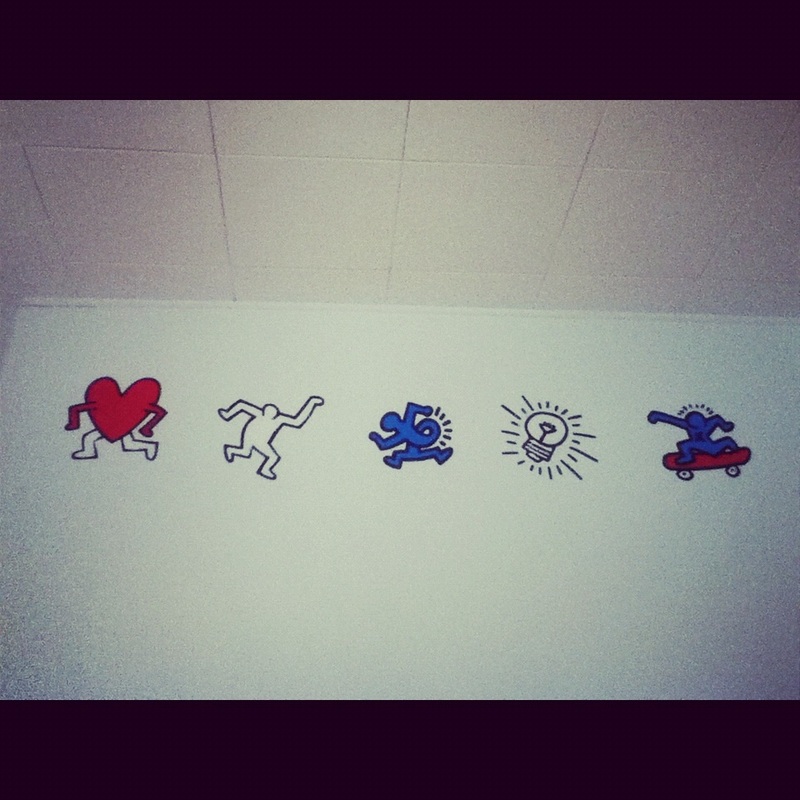 Ever since I was little, walls have been like blank canvases for me. They are just waiting to be drawn on. For most, it would be seen as improper or impolite to color outside the lines in that sense. It’s never been like that for me. Hand me a paintbrush and I’ll cover every surface I possibly can! I remember being 8 or 9, when my little brother and I closed the door to our shared room and gave it quite the makeover. Once our parents opened the door minutes later, we’d drawn all over the walls. Most parents would’ve grounded their children for acting this way. Mine weren’t and I will be forever thankful for that. Those drawings and various quotes professing my love for the Backstreet boys stayed put until we moved out years later. 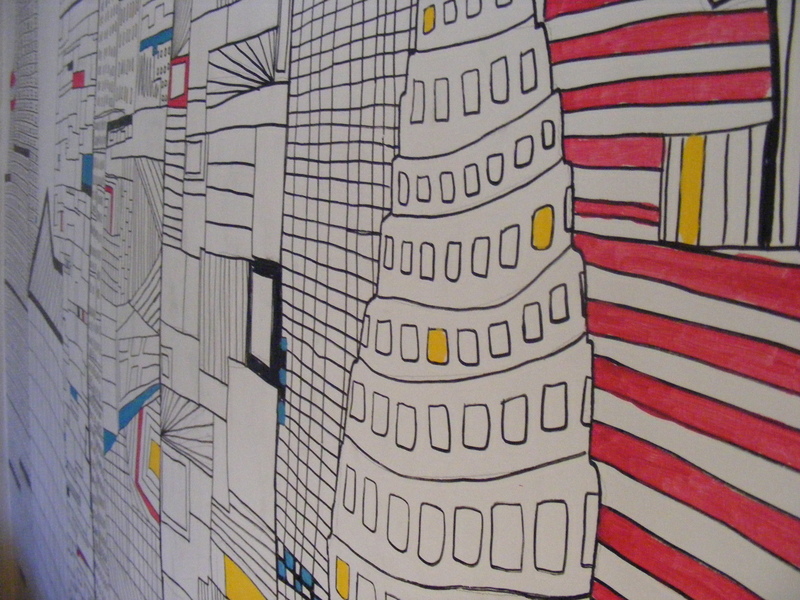 As a teen, I kept going with the self expression through murals. The poetry got deeper, the drawings more detailed. It didn’t always look nice but I sure did love writing punk song lyrics on my wall. I felt especially cool when I wrote the curse words. After my teenage angst phase passed, I decided to go zen (white walls) and covered it all up for a while. When I moved to Montreal 5 years ago, I had a room in a shared apartment with 2 other girls that I didn’t know beforehand. It only took a couple of months before we got comfortable with each other and became good friends. Once I felt more at ease, I got busy with the paint again. This time, I was exploring different shades and textures, more than anything concrete. Now, that we own a place, I’m pretty much free to do what I want on the walls (my boyfriend can veto). Though I have a lot of freedom and could do more if I wished, so far the only place in our house where I’ve drawn directly on the wall is in the living room. The back wall of the room is very wide and our ceilings are high, so it was a perfect spot for a unique mural. At first I wanted to do a zany design, covering the whole wall à la Keith Haring, but I finally decided on a less intense drawing. The initial outline came from an old design that I created a few years ago. As a visuals arts student in college, I always had a blank book at hand. Anytime I felt inspired, I’d take my Staedler pens out to doodle a bit. 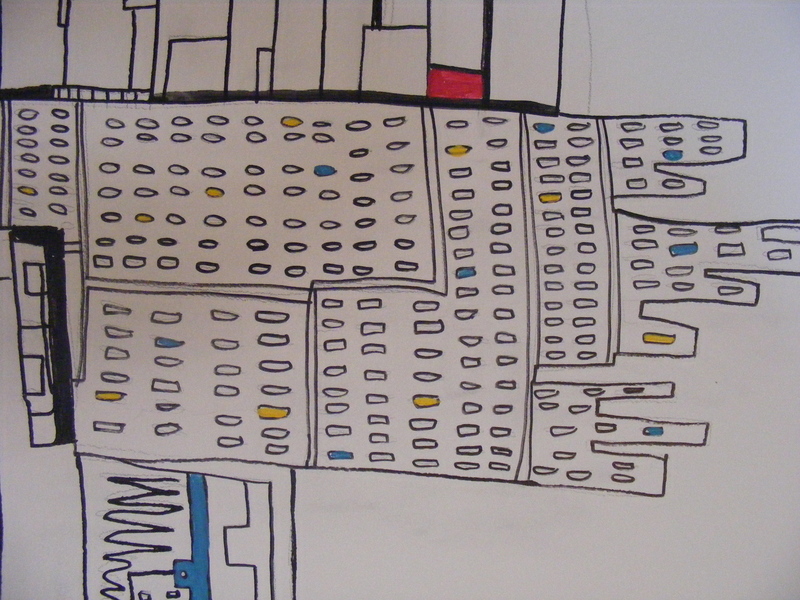 I was inspired to draw this ensemble of buildings after reading a book about Austrian artist/architect Friedensreich Hundertwasser. In a way, he was to Austria what Antoni Gaudi was to Barcelona. 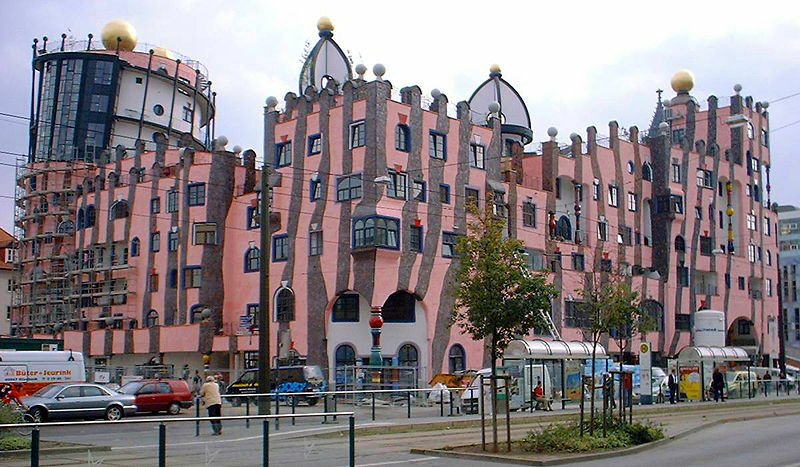 He created colorful buildings that played along with the natural environment. Clearly, he wasn’t a fan of the straight line, which is both refreshing and rare for an architect. I loved that, so I decided to create a fantasy city filled with such buildings. Wouldn’t life be a little bit more fun if more buildings really looked like this? 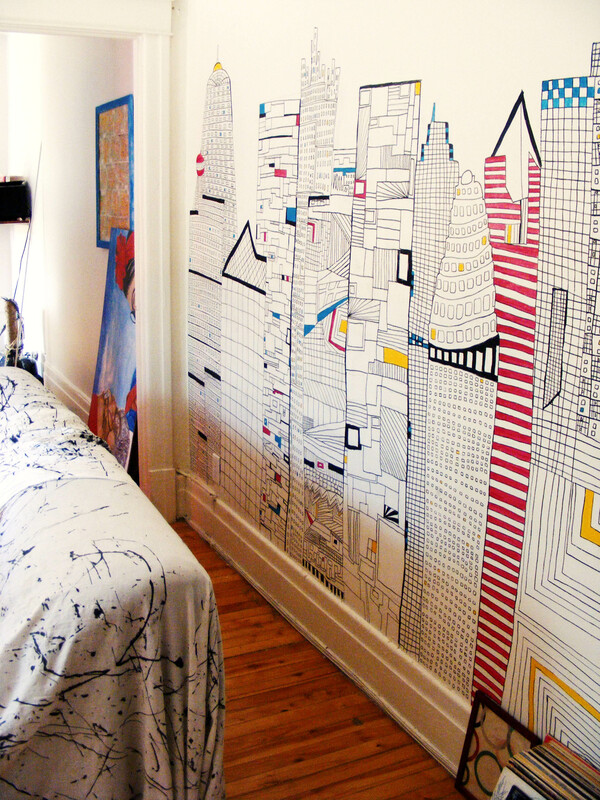 Since that is unlikely to happen any time soon, I decided to paint that colorful cityscape on my wall. 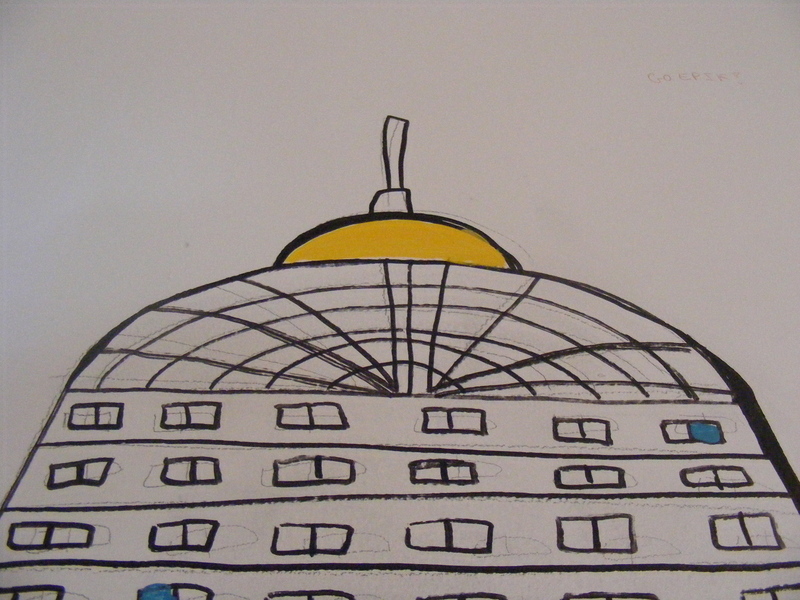 It is my vision of a big city: twisted, funky, colorful, lively. I love it. I think it makes for a fine mural that doesn’t make the room seem smaller, but that makes it all that much more colorful and fun. To speed up the process in making it, I first drew the outlines with a pencil, then I went over them with a black paint pen. This entry was posted in Art, The living room and tagged architecture, art, decorating, decoration, home, home decor, inspiration, lifestyle on 22 September 2012 by lapetitelea. 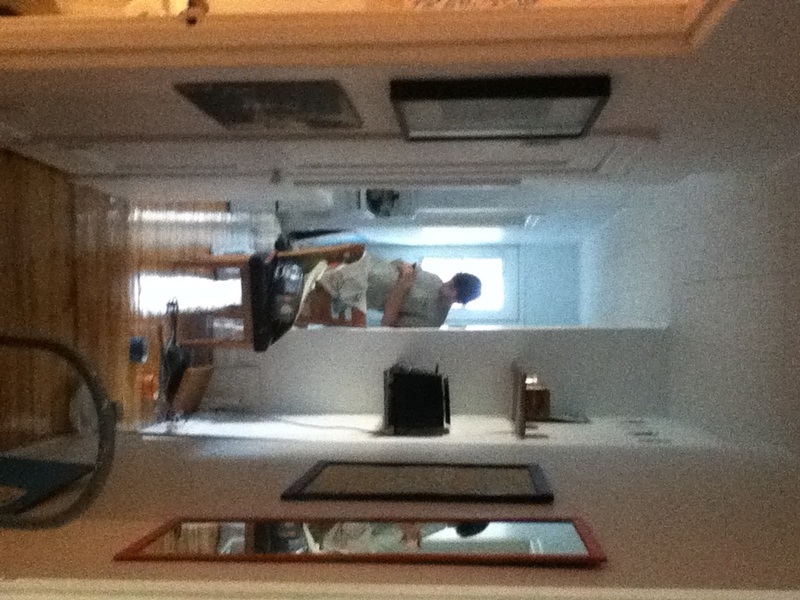 So I’ve decided to share the latest progress: art in my kitchen and hallway. 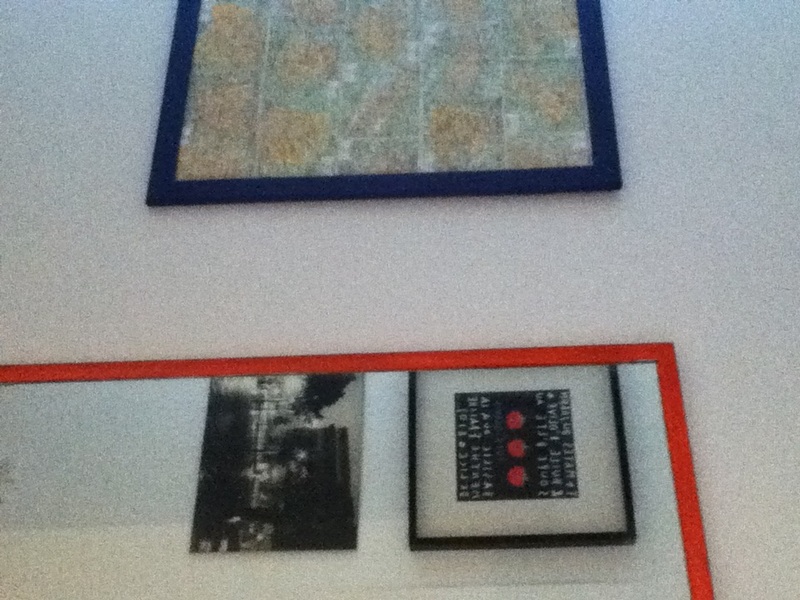 This entry was posted in Art and tagged Art wall, blue frame, Decorating a kitchen, Hallway decorating, Keith Haring, Mafalda poster, mafalda quote communism, orange mirror on 12 September 2012 by lapetitelea. 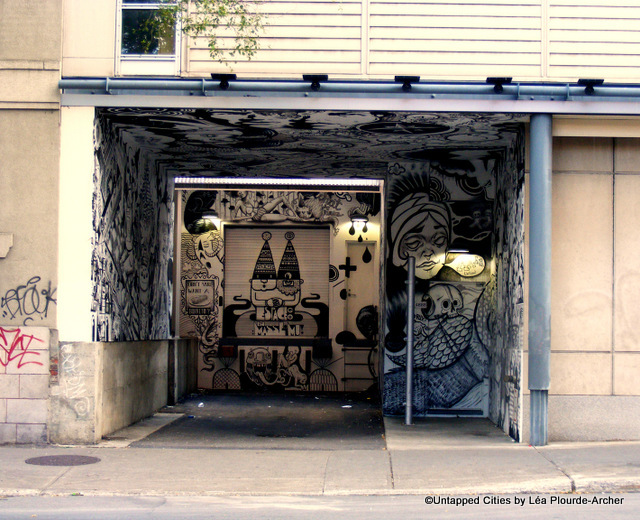 A few weeks ago, I wrote an article about Montreal’s Plateau Mont-Royal neighborhood for a website called Untapped Cities. I invite you to check it out! Fans of art, architecture, travelling and food will love this incredible website that publishes articles written by contributors from all over the world. This entry was posted in The outdoors, Travel stories and tagged plateau mont-royal, Plateau Mont-Royal tourism, restaurants plateau mont-royal, Untapped Cities, untapped cities globetrotter report, Untapped Cities Montreal, walking plateau mont-royal on 10 September 2012 by lapetitelea.